Berlin is a very cool city indeed. And I can’t believe it’s taken me half a lifetime to visit for the first time. It won’t be the last, for sure. Not only is it a fabulously relaxed and laid back city, full of great bars, street cafes, cool shops and flea markets, it has, of course, the most extraordinary history. A painful and disturbing history. There are definitely no victors in war, only qualities (and, of course quantities) of loss. But I think Berlin as a city has confronted its own painful past with a great deal of dignity and nobility. Everywhere you go there are mementos to those lost in the war, transported out of the city and never seen again. Painted on the wall of buildings, or brass plates embedded in the pavement, the names of those who once lived there. And just as one enormous chunk of pain is being confronted and dealt with another comes along. 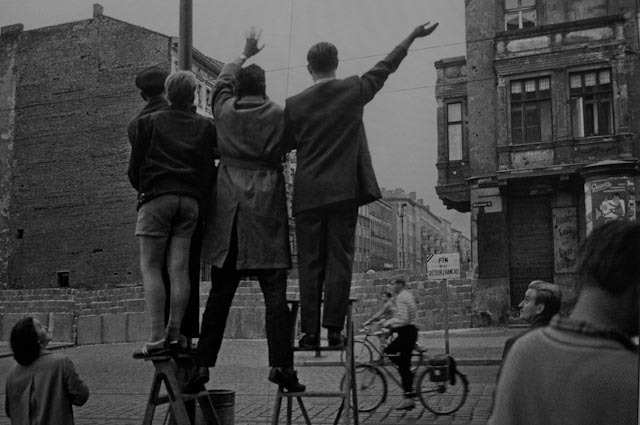 On the morning of 13th August 1961, East Berliners awoke to find themselves sealed off from West Berlin with 100kms of barbed wire, 6 foot high, erected overnight and swiftly followed by The Wall. Walls are mankind’s cry for help. A demonstration of its greatest single flaw. The inability to live peacefully and co-operatively with its neighbours. Every great wall is a symbolic, social, cultural, economic, ideological, emotional catastrophe. The more gargantuan the wall, the greater the catastrophe. Learning from history that we do indeed learn nothing from history. 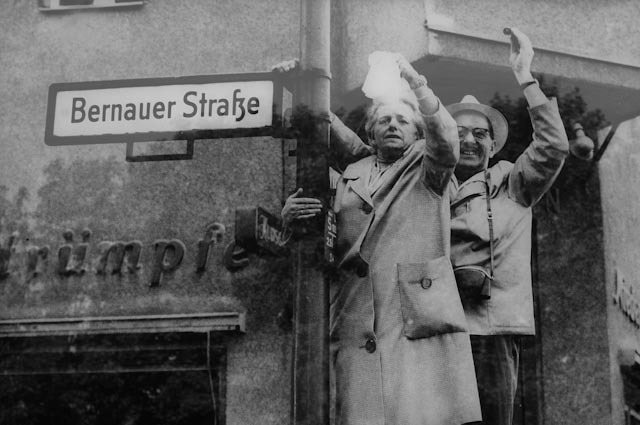 These photos were on display at the cross section of Bernauer Strasse where they were taken 51 years ago. 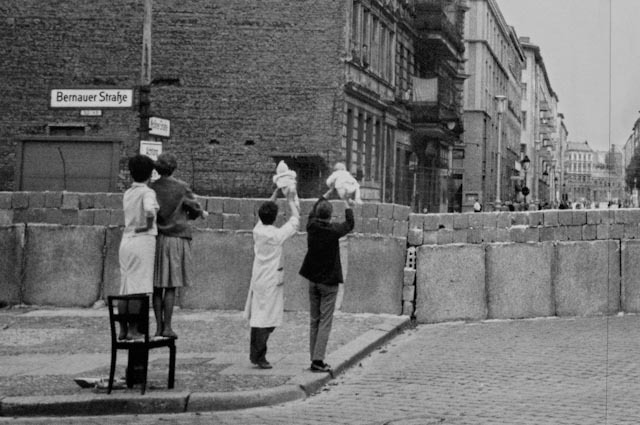 In 1961, the wall went up almost overnight, no-one knew it was coming and no-one was prepared for it. Suddenly, overnight, the division was in place, neighbourhoods were severed, those living along the fault line found themselves both walled in and walled out. Separated so definitively from old friends and neighbours and even relatives. At agreed times, people on both sides of the wall would meet at this corner, wave to friends and family across the divide, show them new born babies, share their news by shouting it across to those on the other side. I found these photos profoundly moving, particularly the woman in the first picture. It communicates so much about the anxiety and sense of loss that people must have felt, she’s waving of the white handkerchief as well, symbolic surrender and helplessness. These photos gave me goose bumps. Beautifully said Jo. I had the pleasure of visiting Berlin myself last Nov and it had a huge impact on me on many levels. Cool Deborah – it’s a great city, isn’t it. I can’t wait to go back now. Any more big epic Everest-style adventures planned for you? Jo, I’m so pleased that Berlin has lived up to (or should that be exceeded) your expectations. The memorial at Bernauer Strasse is a wonderful way of remembering and you’ve put that across beautifully in this post. Berlin most surely surpassed all my expectations. And thanks for your tips – we went to the mouth watering chocolate shop which was amazing but it was the flea markets that were one the main highlights for me … that and the Berlin breakfast!